NASA’s Orion spacecraft will carry astronauts further into space than ever before using a module based on Europe’s Automated Transfer Vehicles (ATV) in this space wallpaper. 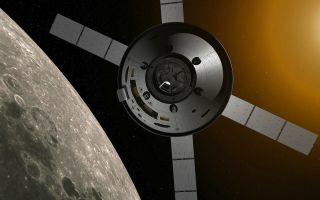 The ATV-derived service module, sitting directly below Orion’s crew capsule, will provide propulsion, power, thermal control, as well as supplying water and gas to the astronauts in the habitable module. The first Orion mission will be an uncrewed lunar flyby in 2017, returning to Earth’s atmosphere at 11 km/s — the fastest reentry ever.